Brown Paper Packages: First Quilt of the New Year! First Quilt of the New Year! Hooray! I have one done in 2010! A simple little baby quilt. But I was so excited when I realized this fabric would work for either a boy or a girl! Hallelujah! Everyone I know seems to be having a baby. . . And no one seems concerned about the fact that I don't have any more boy fabric (imagine that. . .). I am kind of obsessed with diagnols at the moment. And circles. I am hoping my next obsession is straight lines and squares! ;0) It would be so much easier. Nicely done! One of those fabric lines that I didn't fall in love with right out of the gate, but have really grown to appreciate. Great quilt! beautiful! I love the diagonals! and the colors are fantastic. that quilt is beautiful - nice work!! verrry nice..love the BRIGHT colours..they POP!! beautiful!!! I adore this one! This is great! Did you use Nest for some of the squares? 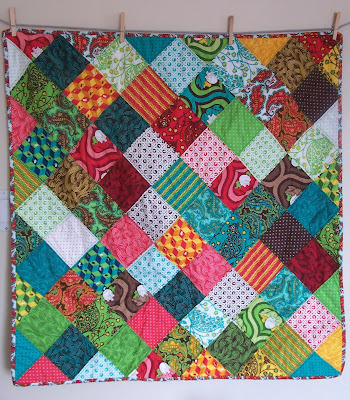 sew bright and happy...a lot to keep a baby occupied looking at all the gorgeous fabric! Hi Leisel. This is really pretty. Good job finishing one already! love the colors and great start to the new year! Very cute! I love the colors together. Nice job! Great job! Congratulations!!! The colors are lovely!